These black forest ham and cheese egg cups are worth waking up to. The Black Forrest Ham creates a smoky, salty, crispy crust for the creamy, cheesy egg filling. 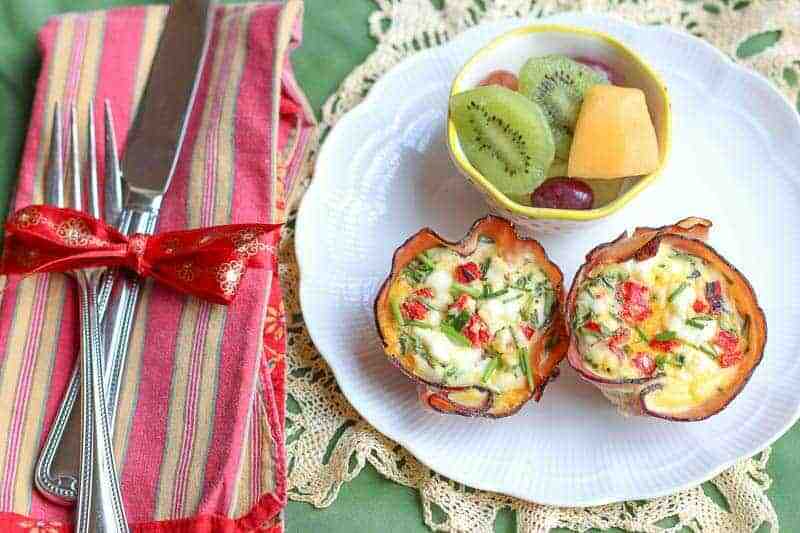 It is a perfect low carb breakfast for those watching your waistline. They are also easy and simple to make and perfect for entertaining. I recently wrote an article for City View Magazine called “Breakfast for the Holidays”. In the article I included this recipe, along with Make Ahead Raspberry French Toast Casserole , Strawberry Stuffed Cinnamon Toast Roll-Ups, and Jalapeño Cheese Grits. All of these recipes are perfect for entertaining and everyday cooking. Of these delicious dishes, the black forest ham and cheese egg cups were my husband’s favorite. We had a few leftover from breakfast, and he would just pop them out of the refrigerator, microwave them, and eat them. He loved that they taste amazing, are high in protein, and low carb. The individual egg cups are fun for entertaining, but they also are easy to freeze. Cook them according to directions. After cooled, wrap them well and store them in a freezer approved container. Defrost them when you are ready to eat them and just reheat. It is best to reheat in the oven, but you can microwave them. I used sharp cheddar in this egg recipe, but it would be delicious with swiss or pepper jack cheese. You can also add in mushrooms and asparagus. 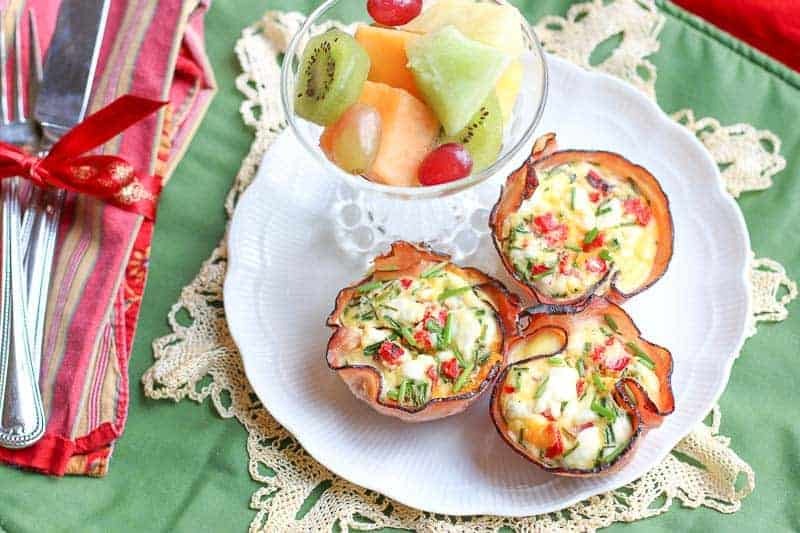 Just think of the egg cups like an omelet where you can change out your veggies and cheese. Everything will be delicious, so have fun with it! If you enjoyed this black forest ham and cheese egg cups, leave me a comment or share the article with friends and family. I hope you enjoy this recipe! If you do, be sure to leave a comment to let my other readers know. xoxo! These black forest ham and cheese egg cups are perfect for entertaining. The black forest ham creates a smoky crispy crust for the cheesy egg filling. In a large mixing bowl, beat eggs, milk, and cream cheese. Add in salt and pepper and mix. Mix in roasted red peppers and chives. Lightly grease muffin pan. Insert a slice of ham in each muffin cup and gently press down in the middle until a cup shape forms. Be careful not to tear and make sure that there are no gaps or holes. Evenly distribute the cheese in each of the ham cups. Using a scoop or measuring cup, evenly distribute the egg mixture in each of the ham cups. Bake Black Forest Ham, Egg, and Cheese cups for about 25 minutes until cooked. Serve. I love portable breakfast options – these are definitely going on my list to make! These look delicious! 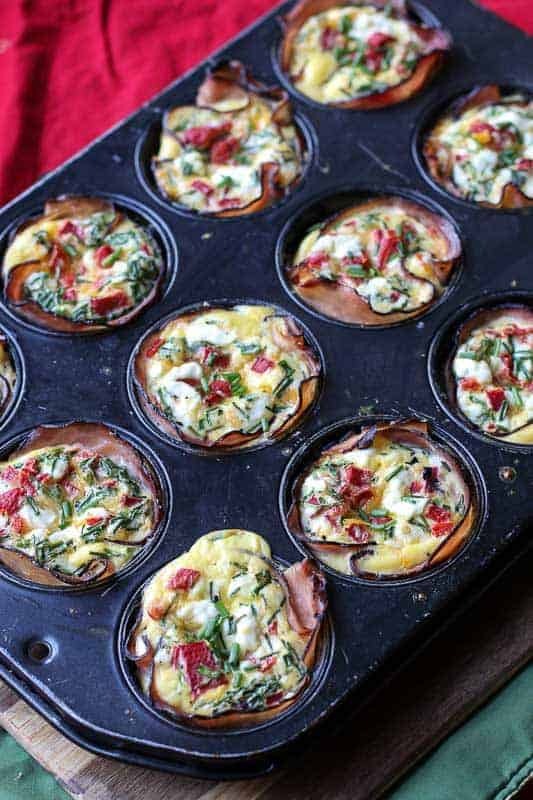 I love breakfast baked in a muffin tin. Going to try this the next time we have guests. These are beautiful! I love the idea to use black forest ham here. How yummy! Great idea for easy grab and go breakfasts! I love how adaptable these are. I’m always a sucker for little breakfast cups made in muffin tins. Love the ham basket on this and all of the color in the egg. Beautiful! What a great idea! 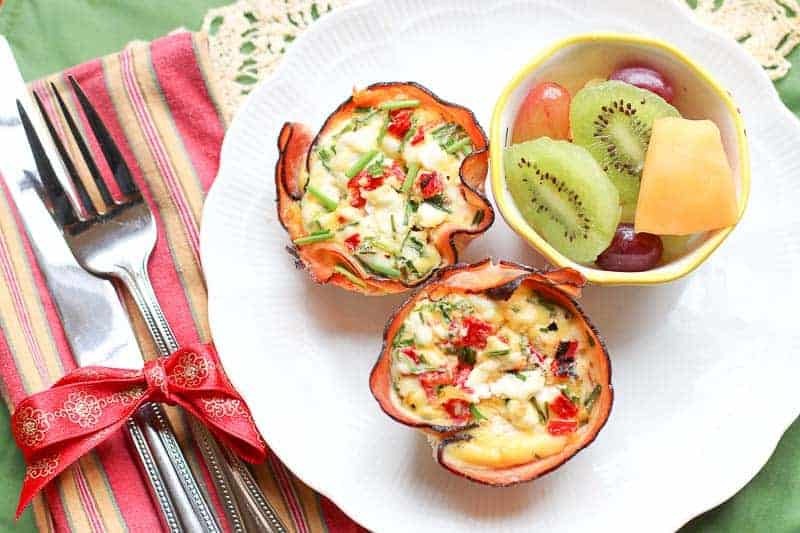 It looks delicious and would be perfect for breakfast or brunch. This is a great recipe for on the go or at brunch. Looks very appetizing. I always love finding new breakfast recipes that are “on-the-go” friendly! These egg cups look amazing!